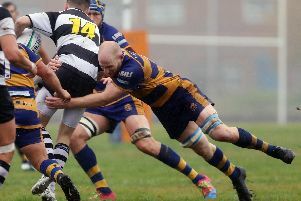 Southsea Nomads’ hopes of gaining a third consecutive Hampshire two victory were dashed by a 24-22 defeat against Winchester Knights. Both teams started well with high energy, heavy contact and pressure in all areas of the pitch. The scoring with a Matt Smith try converted by the ever consistent Jonathan Branston. By half-time the home side had opened up a three-point lead. Nomads came back out with the wind in their sails and it wasn't long before Josh Soper scored their second try, once again converted by Branston. Winchester were allowed back in to the game through poor discipline allowing the home forwards to tumble over the line for a try. Nomads continued to crank the pressure displaying fantastic hands, pace and strength to score a try in the corner. Branston added a penalty kick only minutes later. Winchester had the last word in the final minute of the match with their forwards managing to force the ball over the line for the winning score.